Easter is fast approaching, but don’t worry, there’s still plenty of time to prepare! There’s a lot of fun ways you can celebrate this fun and exciting holiday with baby. Of course, one of the most common traditions is to create Easter baskets. Babies are a little too young to appreciate the majority of Easter traditions, but gift-filled baskets are one thing they will enjoy. So, what kind of things can you put in an Easter basket? 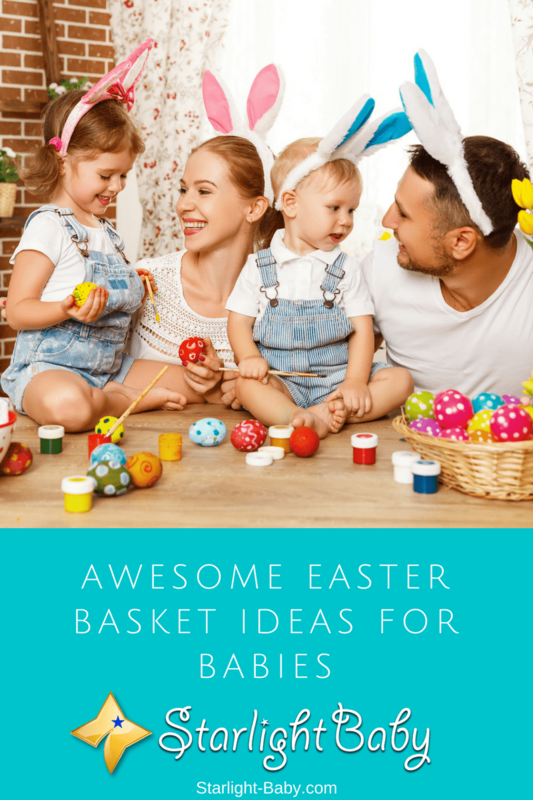 Here, you’ll discover some awesome Easter basket ideas for babies. We’ll look at the different themes you can use for your Easter basket further down this blog. First, let’s look at some of the best things to actually include in the basket. You can then either decide to just make up a random Easter basket containing the items below or choose a theme listed later in the blog and then select the items which best match it. Your baby may be too young to understand the concept of Easter, but they do understand the joy a soft toy can deliver. When you’re trying to decide what to add to your baby’s basket, you can’t go wrong with an Easter themed soft toy. Bunnies are especially cute, and they come in a wide range of designs. Take a look at the different Easter bunny soft toys on offer and choose one you think your baby will love. Clothing is always needed when you have a baby. It’s surprising just how quickly they can grow. So, why not treat them to some new clothes in their basket? You could throw in bodysuits, pajamas and some cute little socks. If you want to splash out, you could also include an Easter dress-up outfit. Dressing your baby in an Easter outfit and taking photos will provide you with memories you can cherish forever. Shop our Easter clothing line by clicking here! Even if your little one is too young to understand the words, an Easter book can be a great educational item to include in an Easter basket. Reading to baby is an excellent bonding activity and it really helps to boost their development. The great thing about Easter themed books, is they often feature cute, cuddly characters that your baby will love to look at. Make it more exciting by investing in an audio book. The additional sounds will really grab your baby’s interest and make the experience all the more enjoyable. We’ve already mentioned clothing, but bunny slippers deserve a spot of their own on this list! If you do a quick online search, you’ll find lots of adorable bunny themed baby slippers. There’s nothing cuter than waking up on Easter morning and seeing your baby wearing cuddly bunny slippers! Burp cloths are an essential accessory every parent needs. Never underestimate your baby’s ability to spit up and ruin several outfits a day! Burp cloths prevent this or at least limit the number of times you need to change your little one. The thing about burp cloths is you can never have too many. So, why not pop some Easter themed burp cloths into your baby’s basket? Babies LOVE bath toys! In fact, they can prove essential at helping them to overcome their initial fear and dislike of baths. They come in lots of shapes and sizes and you should be able to find lots of Easter themed bath toys. This is a gift which won’t just delight your baby, it will make bath times easier for you too! If you’re looking to add something unique to the basket, music is a great choice. You can buy baby-friendly music which your little one is sure to love to listen to. It may be a little tricky to find Easter inspired music, but any baby music will work. Why not check out the Disney Baby Lullaby album for example? These are just a small selection of the things you could include in your baby’s Easter basket. So, let’s take a look at the themes you could adopt. You don’t need to have a theme for your Easter basket, but it may help you decide what to include if you do. So, here’s a few of the best Easter basket themes for babies. The Bunny Basket – This one’s pretty easy to complete. When you’re looking for Easter themed gifts, you’ll notice bunnies tend to be one of the most common themes available. From stuffed bunny toys to bunny slippers and even bunny blankets – you’ll find so many bunny related gifts to include in the basket. Imagine your little one’s face when you present them with so many bunny related items! The Personalized Basket – This is an especially great idea if you’re celebrating baby’s first Easter. Investing in personalized gifts means you and your child will have a timeless memory of their first Easter. You can personalize everything these days from soft toys to books so finding ideas for the basket should be pretty easy. As well as personalizing the actual items, you could also make it personal for your baby. By this, we mean choosing items which relate specifically to your own baby’s interests. Of course, some babies may be too young for this. However, if you’ve noticed your baby has a preference for certain colors for example, you can be sure to add items which match their favorite color. A Lullaby Basket – This clever idea is brilliant for helping baby get to sleep. Most babies have some sleep issues, but some are definitely trickier than others at bedtime. If you struggle to get your baby calm before bed, a lullaby basket is ideal. Include things like a calming baby lotion, a new night light, soft toy, a super-comfortable blanket and a lullaby CD. These are just three great themes you could adopt. Whichever type of basket you choose to create, the main thing is to have fun when creating it. Every day that you spend with baby is special, but holidays such as Easter make parenting even more magical. You don’t even need a theme. Just create a basket you think your baby will love. Do you enjoy creating Easter baskets? We’d love to hear your stories, or better yet, send us a photo of your Easter gift basket! I am a Hindu and I don’t celebrate Easter. Actually, I do not even know much about Easter tradition. However, I found the idea of creating a basket wonderful. I might make a basket for my baby for his first birthday which is two months later. I want my baby to grow up to become a tolerant man, therefore, I will try to introduce various traditions and cultures to him so that he will respect every religion and cultures. Such a wonderful idea, vinaya. I salute you for your idea of introducing your son to various traditions so he will learn to respect them. That’s what we need in this world these days – respect and understanding. You are truly on the right path in raising your child. Truly, the thing with creating a Easter basket is that one can get to understand to have nice moments with the child and I always recall the times that my mom used to buy new clothes for me during festive periods of which the Easter period is inclusive. I always have fun moments back in those days and one that I wish my kids will enjoy. That’s what I’m saying. It’s all about memories and quite amazing the way I still recall vividly those cute moments I used to spent with my parents and siblings during the period of Easter and other festive season. The feeling is quite unique and memorable. I’m looking forward to celebrating this coming Easter with my whole family member. I’m inviting my parents over to spend it as one big family and I’m definitely going to make use of some tips provided in the article above to have a really nice and wonderful experience during this season. Thanks for sharing, it’s very helpful. You’re very much welcome, Emmaz. You are so correct, celebration carried out by all the family members always is the best kind of celebration because lots of wonderful memories would be made throughout that day. With the tips discussed on this article, I’m definitely going to try and incorporate some that I can into our this year’s Easter celebration. I have come to understand and observe that babies too love songs just as adults do. What you need to discover is the kind of songs that are good for your little ones and get them to play always for the baby. It somehow helps in soothing them and putting them to sleep. Remember every parent would want their babies to have a good nap time in order to afford them the opportunity to take care of other home chores. Oh yes, I totally agree. A playlist of lovely songs would really come in handy during nap time. Babies who sleep well at nap times provide their parents with ample time to do some household chores or other baby-related tasks like cleaning baby bottles, etc. This exactly how it is, I know this because I make use of the trick always with my little one. Even when the baby isn’t sleeping, I would play music with a mild tone to use it and hold the child’s attention before sleep eventually takes over. Good on you, Martinsx. Not all babies are created equal, haha. That trick wouldn’t work with my niece’s daughter. She is ever awake at most hours, haha. Haha, it’s absolutely true what you said about some babies being different. Some can’t sleep with any kind of noise around including music and they are most likely to wake up at any slight sudden noise. Remembering what Easter Eggs symbolizes when I was a kid and the fun and memories of celebrating with the family, truly heartwarming. Yes, the happy memories of Easter egg hunts, bunnies and more come to mind when reading this article. Heartwarming indeed. Unfortunately, I wasn’t given any chance of knowing anything about Easter Egg Hunt during my childhood age by my parents but now, I wouldn’t deny my kids such memories because every kid deserves to participate in the act. I can relate to that, Martinsx. I also didn’t experience Easter egg hunts as a child, but now that I’m aware of it, I let my kids join and enjoy it. Same thing with trick or treat during Halloween. I wouldn’t want them to miss out on these fun childhood events.